Vital component of cell membranes. Potentially helps combat diseases triggered or affected by disturbances in cell membranes (multiple sclerosis). Our dietary supplement Calcium AEP is formulated from a specific and active form of calcium: calcium AEP or calcium 2-amino ethyl phosphoric acid. This form of calcium was discovered in 1941 by biochemist Erwin Chargaff. It was identified in the structure of the cell membrane structure where it plays an essential role. Studies on calcium AEP have indeed confirmed its importance to the cell membrane. 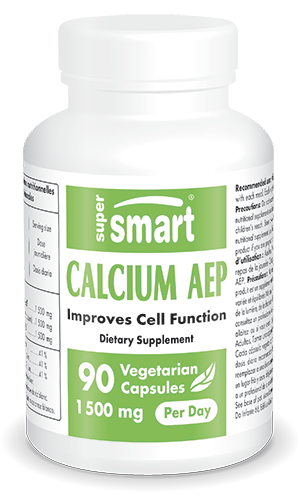 Calcium AEP is thought to play a particular role in cell membrane integrity as well as in improving cell function. treat gastrointestinal problems such as gastritis and colitis. Calcium AEP’s vital role also helps protect cells against certain types of damage. This specific form of calcium may thus offer potential against diseases involving the degeneration or breakdown of cells. It is, for example, being investigated for preventing, inhibiting or treating multiple sclerosis. This is an autoimmune disease which results from demyelination in the central nervous system, the destruction of the protective myelin sheath that normally surrounds nerve cells. The disease is caused by a dysfunction in immune cells. While these are normally involved in protecting the body by destroying harmful agents, they instead turn on the cells of a person suffering from multiple sclerosis, attacking, in particular, the cells that produce the myelin sheath. Without this protective sheath around nerve cells, lesions develop in the form of sclerotic plaques which gradually lead to motor, sensory and cognitive problems. While there is as yet no treatment for the disease, current studies on calcium AEP are providing new hope. The numerous scientific studies on calcium AEP confirm its crucial role and therapeutic potential. To deliver the benefits of this specific form of calcium, our dietary supplement has been formulated to provide 500mg per capsule, with a recommended dose of three capsules a day, one capsule to be taken with each meal. This dose can be adjusted in line with your needs and the advice of your therapist. Each vegetarian capsule provides 500 mg of calcium AEP (Calcium 2-amino ethyl phosphoric acid), an essential component in the structure of cell membranes.